just a quick post today. I wanted to play in the Paper Smooches challenge - have not been playing in a while. This week its an inspiration photo - see below. I used patterned paper - in my stash forever and a strip of luckily matching card stock - even older. 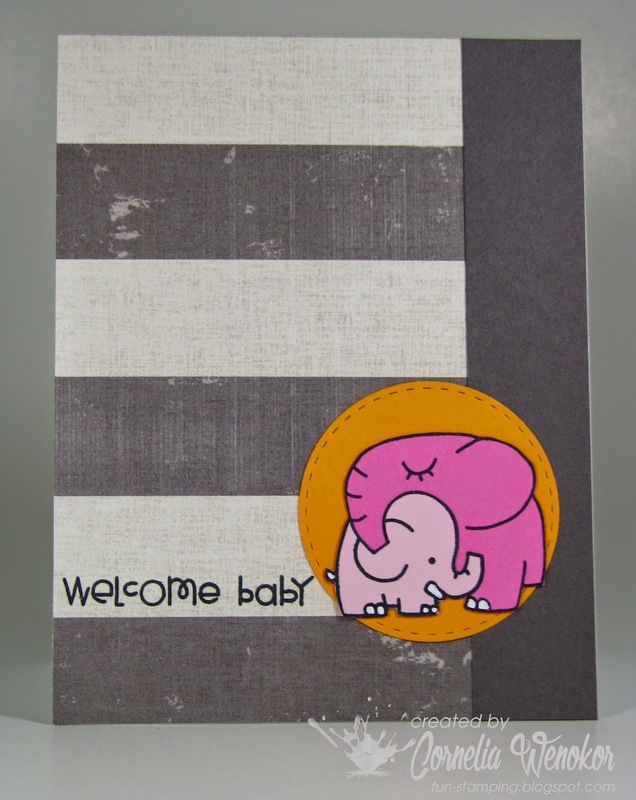 The elephants and sentiment are paper pieced and form that cute set A Little Lovin. the stitched circle is by SSS. Tolle Umsetzung, die Karte ist echt süß geworden. So cute, those elephants ! Definitely a very sweet card, Cornelia. Great take on the photo inspiration. Such a lovely colour combo, and perfect for those sweet little elephants! Perfect use of stashed patterned paper. Thanks so much for sharing your sweet creation with us at CASology this week! So süß und Deine Umsetzung perfekt!! Sehr süss und modern! Super! What a sweet baby card! Love the paper pieced elephant pair. Thanks for joining us at Paper Smooches SPARKS! This is just so sweet...love those adorable elephants. CUTE!!! Very perfect for the Challenges!!!! Thanks for sharing your creativity with us at CASology!!!! PS congrats on seeing you at Unity as CARDS WE LOVE!!! and your card so cute on pink and orange colors and great paper as Base too..